This is my first post joining in with Helen’s ‘End of month view’ meme at the Patient Gardener and it’s also the ‘big reveal’ of areas of the garden as yet kept under wraps. Firstly, (and nothing to do with the end of month view as she’s there all year) meet the ‘Lady Diver’, another Denis Fairweather sculpture bought for our 25th Wedding Anniversary to keep the ‘Gentleman Bather’ company (see Don’t f-stop me now). Unfortunately when we got them side by side we realised they were a slightly different scale and didn’t work together, so the lady has been moved to preside over the veg patch. In retrospect this is probably the secret of a happy relationship – a certain amount of distance! 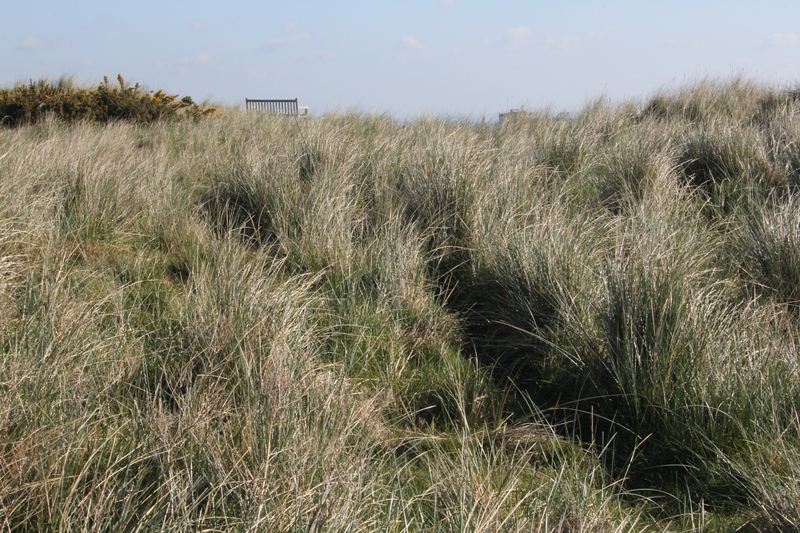 In this shot you can see the two ‘swing beds’ and at the rear of the picture, the ‘grass bed’. The highlights of the swing beds this month have been the Euphorbia characias Wulfenii, forget me nots and the Avignon tulips – some in pots and some in the ground. However, whilst I love these tulips in isolation (they look great in a pot my the front steps), I have found the fact that they clash with both the crab apple blossom (now over) and the pot of pink marguerites (almost in the centre of this picture) rather disconcerting, and I think next year they’ll be replaced by something equally bright but better toning. Working east from the swing beds is the strawberry bed which sits below the Lady Diver. The soil in the bed has definitely sunk considerably since the beds were built four years ago, and this year I meant to dig out the strawberries (which have been in since that time, and are now rather congested) give them a sort out, top up the soil and replant, but somehow with a poorly ankle it just didn’t get done, and now I look and they’re already flowering. Too late for this year I feel. Above the strawberries is the main veg bed full of nothing but promise. Nearer the house than strawberry bed (you can see the strawberry bed at the back of this picture) are the two troughs. 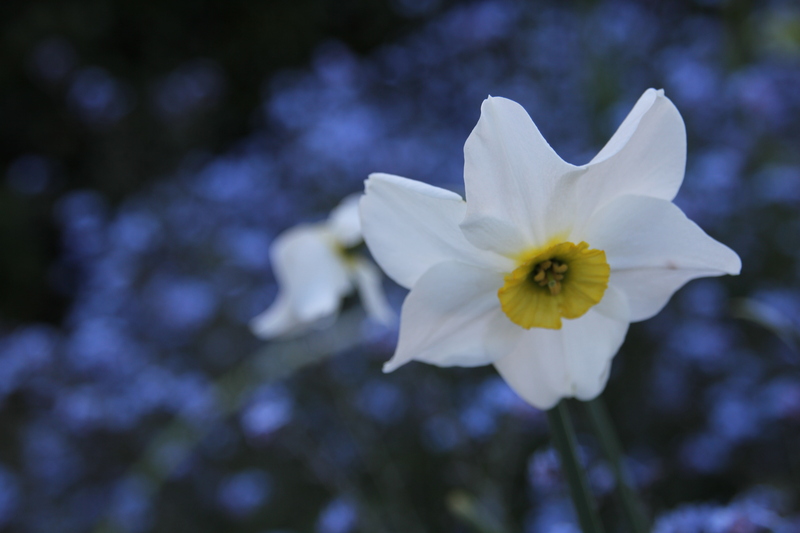 The daffodils are now very nearly over, but the lovely stocks are continuing. 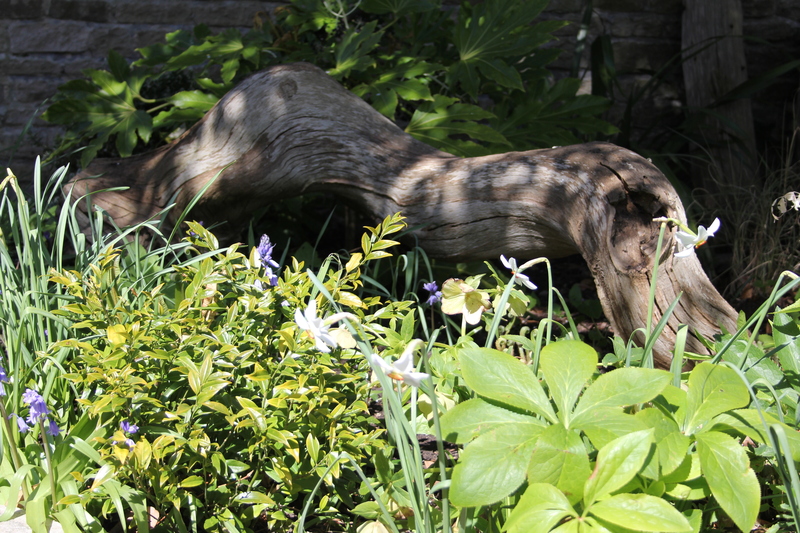 Sitting on the swing yesterday I had a sudden burst of inspiration as to what I can do about the dying daffodil foliage – turn the troughs around by 180 degrees. 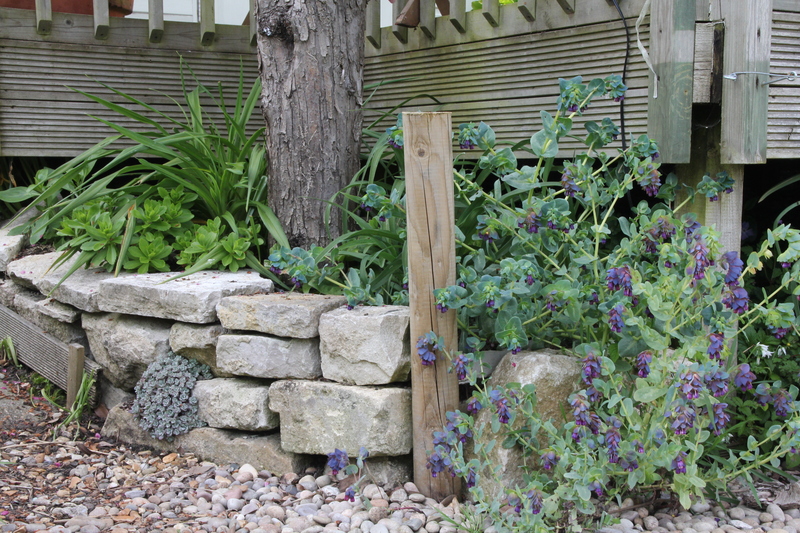 This should hide the foliage by putting it behind the stocks, put also, it makes sense as at the moment, the emerging Allium Purple Sensations are actually coming up in front of the stocks. Turning the troughs around would put them behind the stocks. And come next spring, I can reverse the whole process. Sounds foolproof, all apart from finding someone strong enough to lift them! Sitting on the decking above the troughs is a cold frame made out of some unused windows. It never got closed this winter as it’s full of hardy things, generally grown from seed by me, including lots of both Verbascum chiaxii Album and Agapanthus. 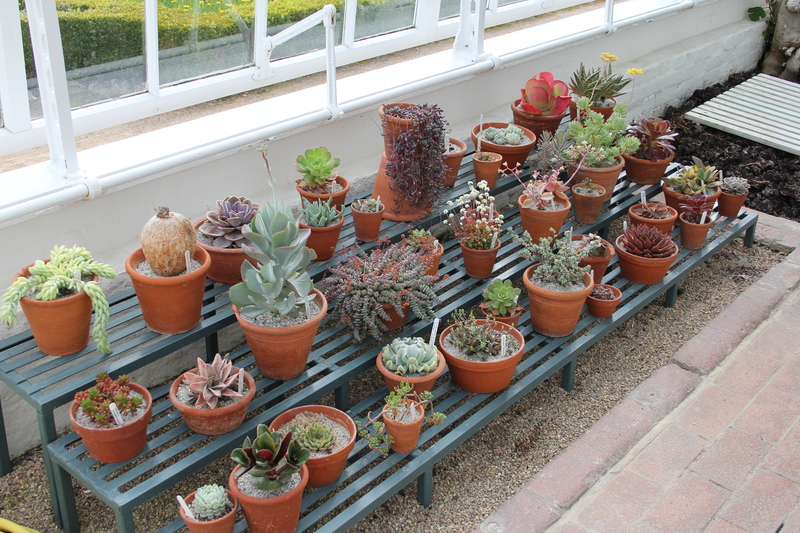 I desperately need to get planting so that I can 1. free up the space for hardening off and 2. free up the pots for potting on. 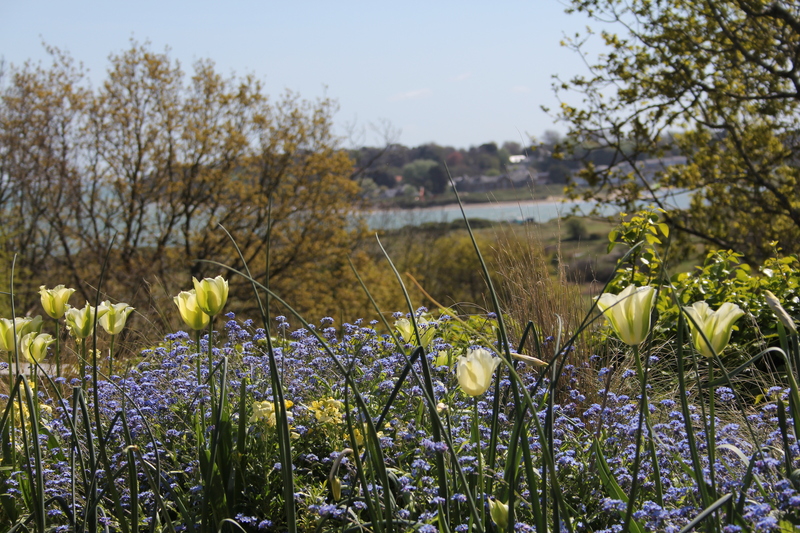 At the westerly end of the decking the OH created a small new bed which has become home for my lovely daylilies bought from Nick at White Cottage Daylilies, just across the harbour in Bembridge. Obviously the daylilies aren’t doing much at the moment but the Cerinthe (which self seeded and overwintered) is stunning, and I love the little silvery Sedum. This is looking due south from the daylily bed towards the chicken shed. Sadly the chickens got killed by a fox last year and we haven’t yet replaced them. However the shed is providing a useful support for the Montana flowers. The garden is really east and west of the house (at either side, rather than front and back) and the drive is in the middle. The drive bed, above, which previously was looking very ‘springy’ with lots of daffodils, pulmonaria and a few bluebells, is now looking a little tired apart from the Erysimum. However there are Alliums to come and then i’ll pop in something I’ve grown from seed. 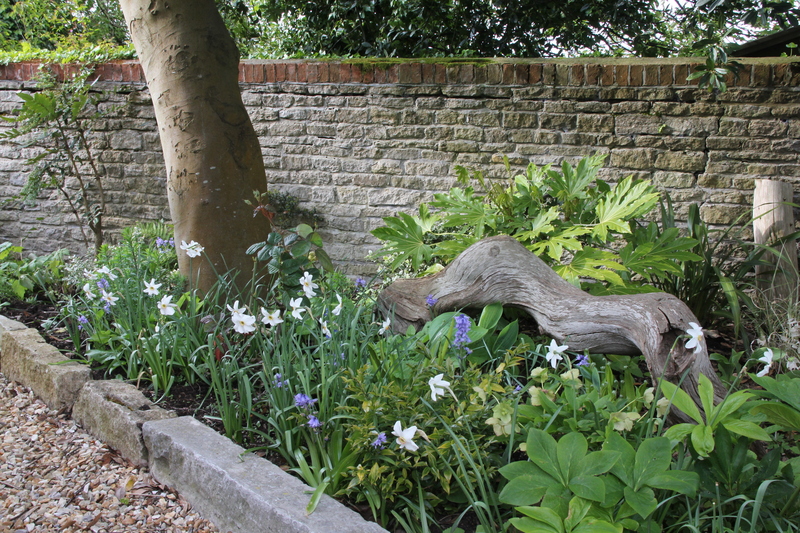 At the west side of the drive (alongside the porch) is the east facing herb bed. Many of the herbs survived over the winter – most noticeably the parsley, which goes from strength to strength. And round the corner from the herbs, facing north, is the hosta bed. And at the end of the drive, facing the road, is the greenhouse, but that needs a post all of its own. To the west of the drive and in front of the house, there is a small lawn, a table, (where the wisteria is) and the so called ‘oak bed’ because the bed spends almost all of its time shaded by the over-the-road oak . 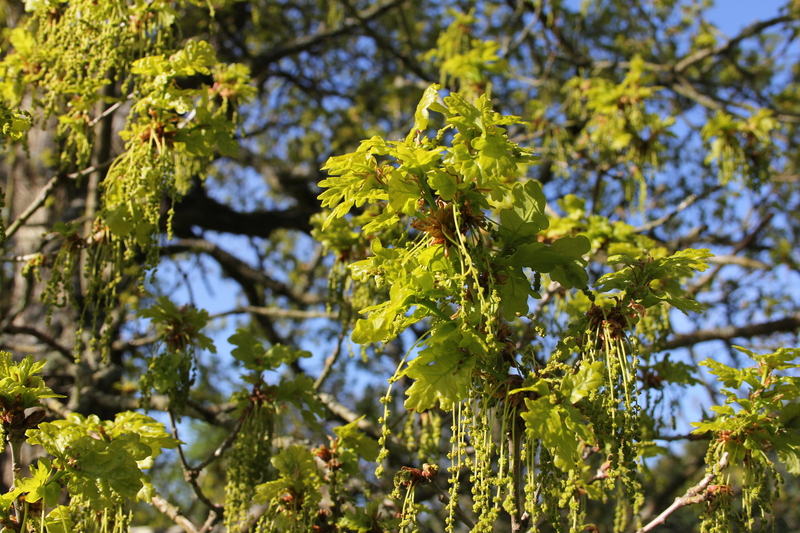 The beds are fine in spring as they get more light, but in the summer once the oak is in leaf I do find them challenging. 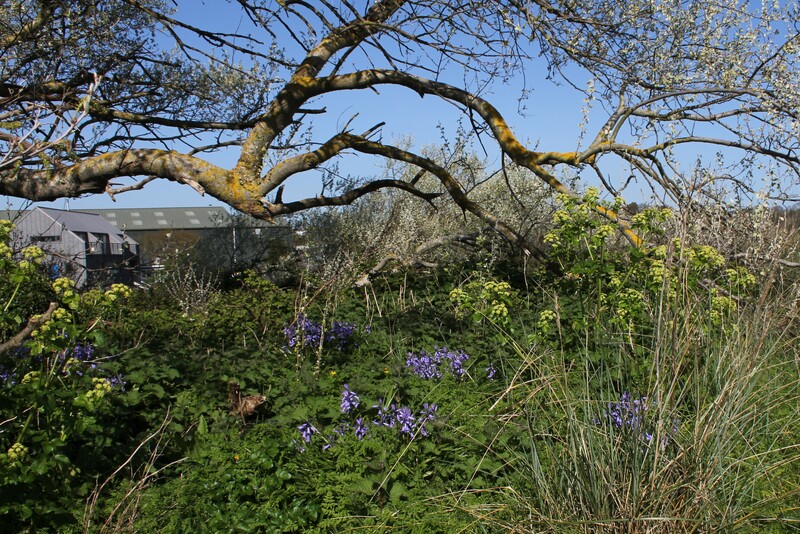 My biggest success has been planting a Cercis canadensis ‘Forest Pansy’ (just coming into leaf in the left hand picture), but otherwise the bed is dominated by a large viburnum I’d like to have out, and, at this time of year, a lot of green perennial foliage. 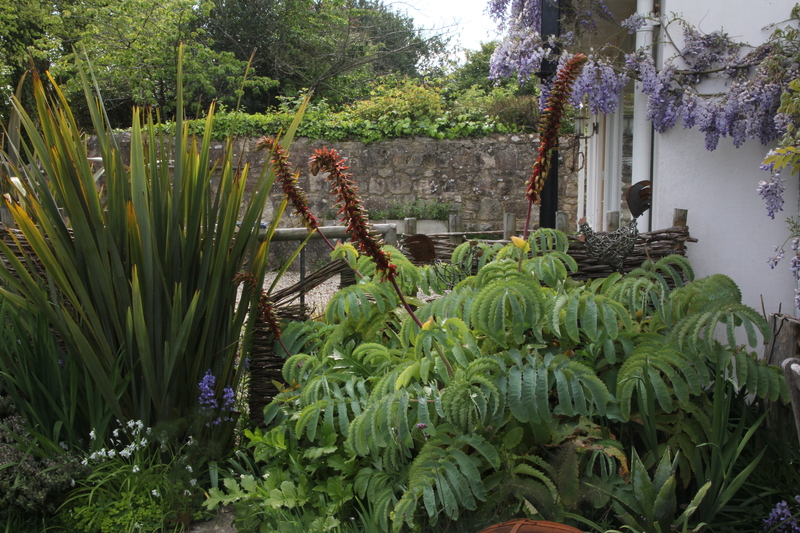 At the border with our neighbours is my lovely Melianthus major, and also our Wisteria, extending its influence next door. And lastly, some tender plants I’ve recently moved out from the greenhouse, are also at this end of the garden – firstly a shallow bowl which sits on top of a large olive oil jar and then a series of succulents in pots in a lovely old wire ‘carrier’ bought from the gorgeous Petersham Nurseries, close to where we used to live. Many thanks to Helen for hosting this meme, check out her ‘End of the month view’ using the link at the top. This entry was posted in End of month view, Garden and tagged Allium Purple Sensation, Cercis canadensis Forest Pansy, drive bed, Erysimum Ivory Giant, Euphorbia characias Wulfenii, Grass bed, hostas, Matthiola Incana, melianthus major, Oak Bed, shady bed, stocks, strawberry bed, succulents, Swing beds, troughs, tulip Avignon, veg bed, Wisteria on April 30, 2014 by jenhumm116. I just thought I would give an airing to some lovely ‘dilly dallying daffs’ which are continuing to look fresh in my garden, despite this crazy, accelerated spring. Firstly N. Sinopel above, in the Grass Bed. 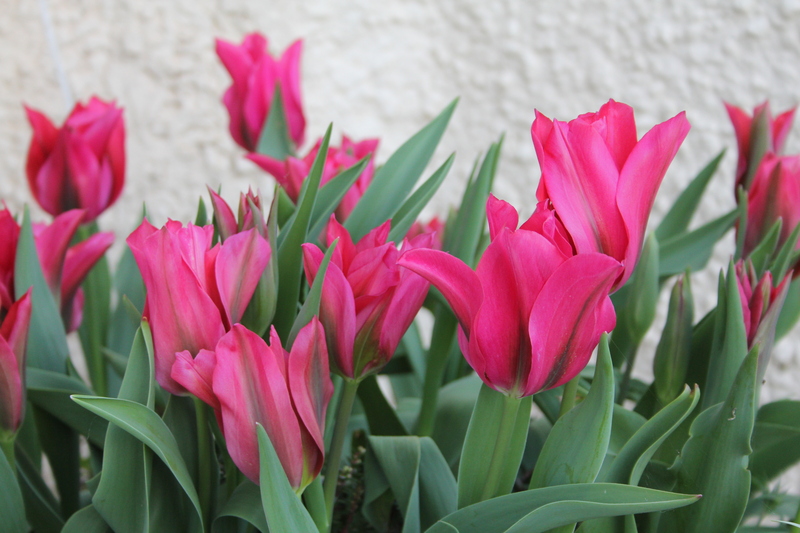 This is the one which was expected to come out before the Spring Green tulips, and now, for the second year running, has come later. The corona is not as green as I remember in the photos when I ordered, but there is definitely green at the ‘eye’ and I do love the overall look. And they have come back well for the second year. 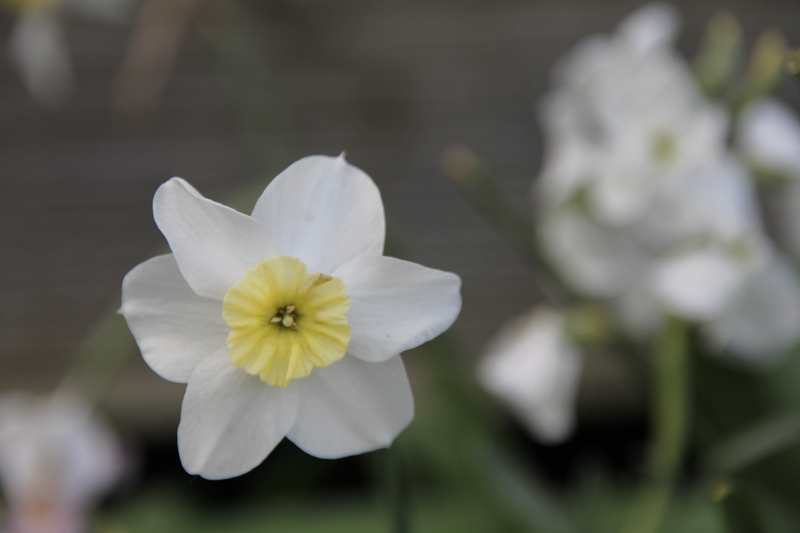 Secondly, the classic late daffodil, N. Old Pheasant’s Eye. These have a similar shape to Sinopel, but are slightly larger. They’re currently doing a good job of lighting up the shady bed. And laslty the troughs. 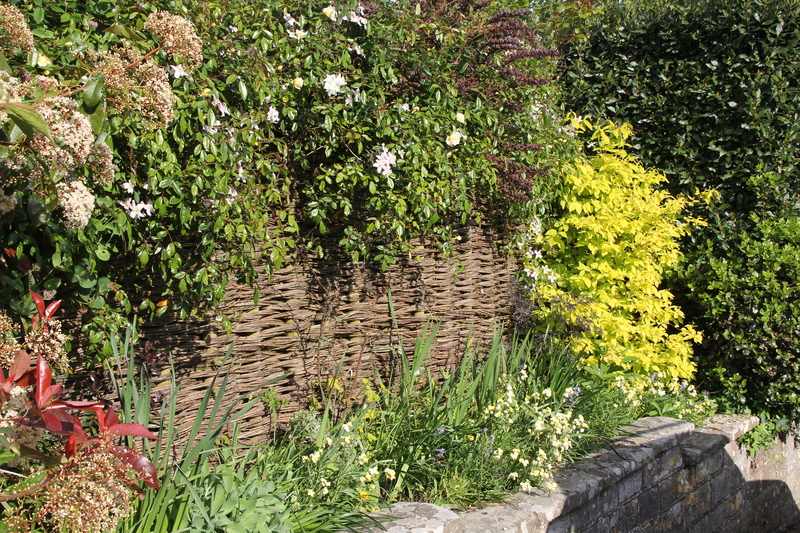 I planted masses of daffodils in the troughs this year, but did get a bit confused as I thought I’d ordered and planted Cornish Chuckle, but I think Bloms gave me Minnow. 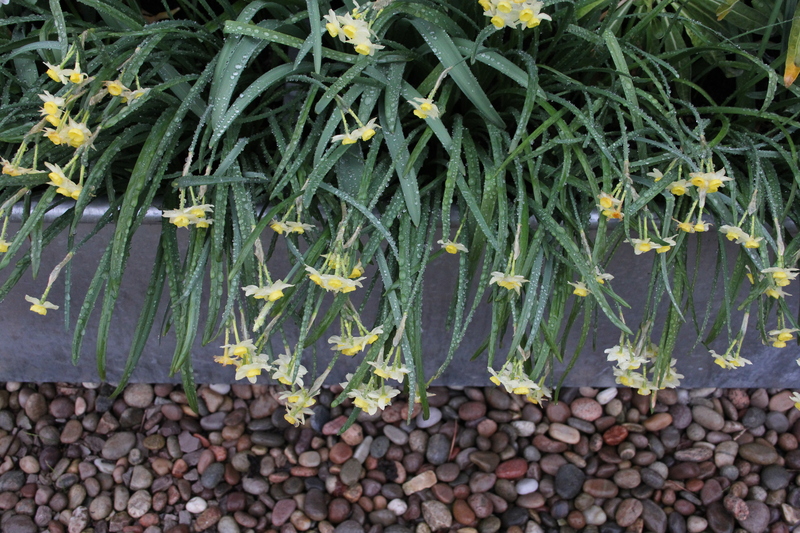 Here they are weighed down by raindrops in early April. I didn’t plant as many as the Minnows, but to be honest, I’d completely forgotten I’d planted a succession at all, so they came as a lovely surprise! 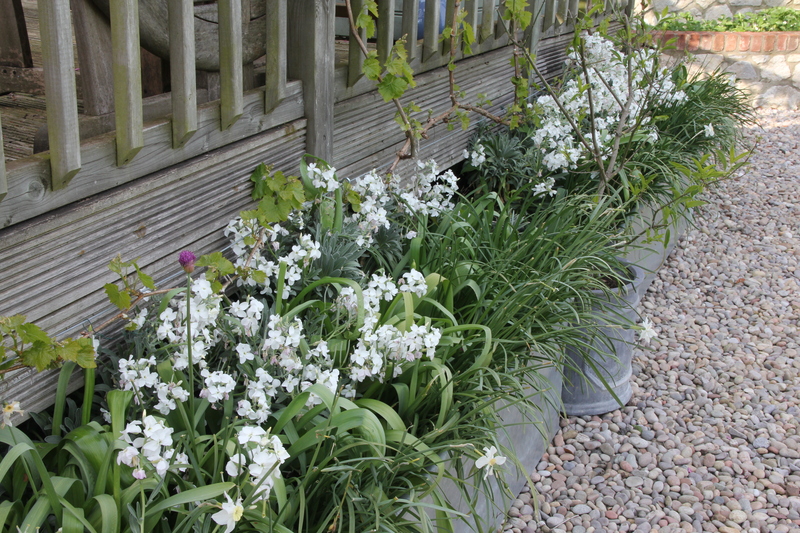 You can see in the troughs I’ve also got the white stock Matthiola Incana ‘Pillow Talk‘, which I grew from seed in 2012. It smells absolutely fabulous. Of course all these daffs in the troughs are very well, but I’m not looking forward to when they’ve finally finished flowering, and all I’ve got to admire are decaying leaves…. 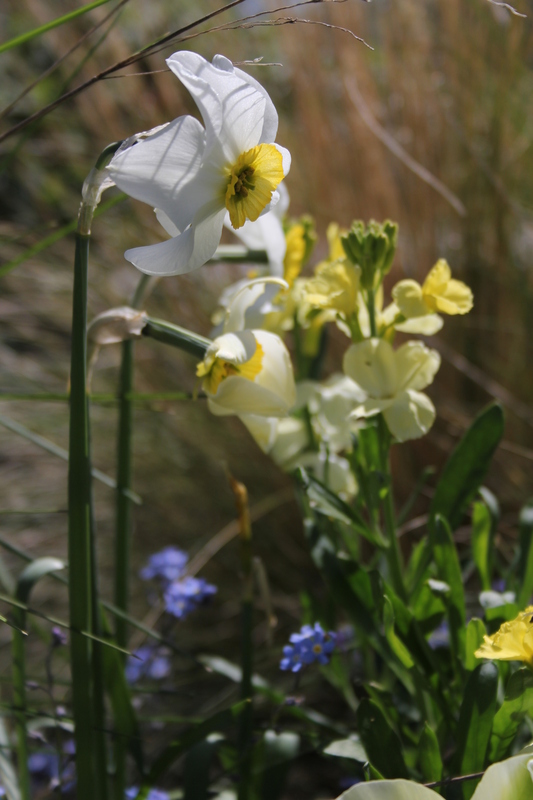 This entry was posted in Garden and tagged Matthiola Incana, Narcissus Minnow, Narcissus Old Pheasant's Eye, Narcissus Segovia, Narcissus Sinopel on April 26, 2014 by jenhumm116. 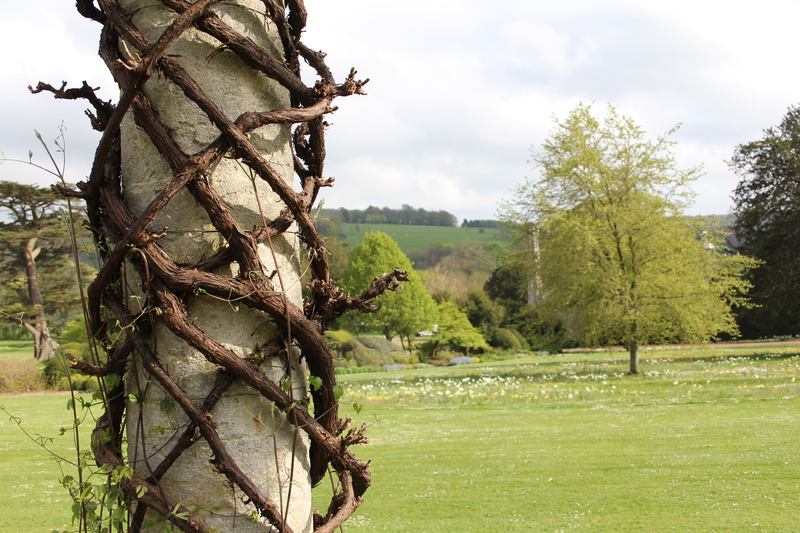 Almost exactly a year ago I attended a course at the inspirational West Dean Gardens. The event was a weekend course, ‘Dig your blog’ with Jane Perrone and Jacqui Hurst teaching a group how to (garden) blog. And, although it took eight months and redundancy for me to actually post my first post, I would definitely say the foundation stones were laid a year ago at West Dean. The photos above and below were taken during that course. and many tulips are out. And yet there was a chill in the air and a rather cruel breeze whistling round my (ill judged) bare ankles, making an in depth investigation of the thirteen (thirteen!) glasshouses rather more appealing than the 2 1/2 mile Parkland Walk. 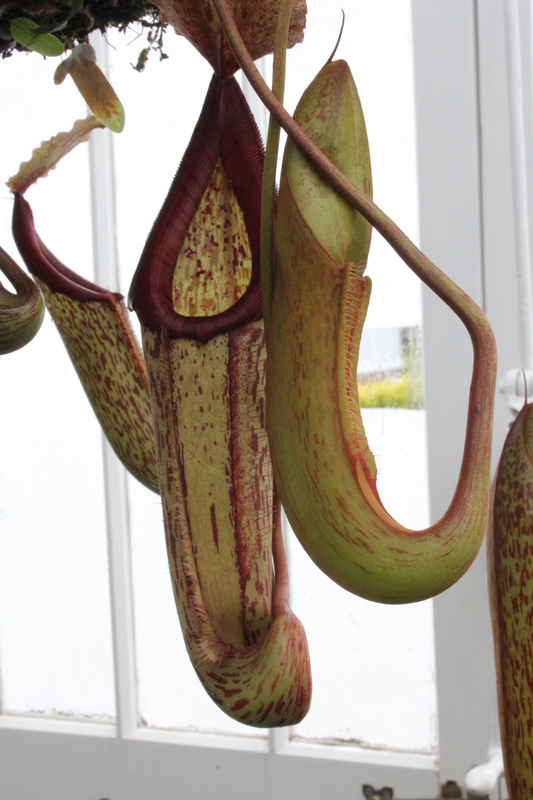 and lastly, (in the glasshouses), Nepenthes x mixta x maxima, the Pitcher Plant. This was seriously maxima. According to Wiki answers, in addition to insects, they can also ‘eat’ mice. I reckon this one would have given a rat a run for its money. 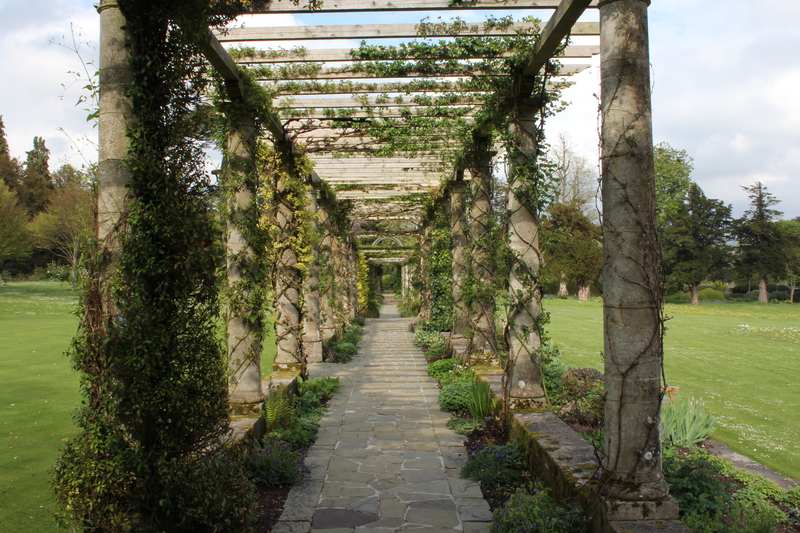 And then back outside to the 300 foot long pergola, designed by Harold Peto in 1911 and one of the longest in the country. 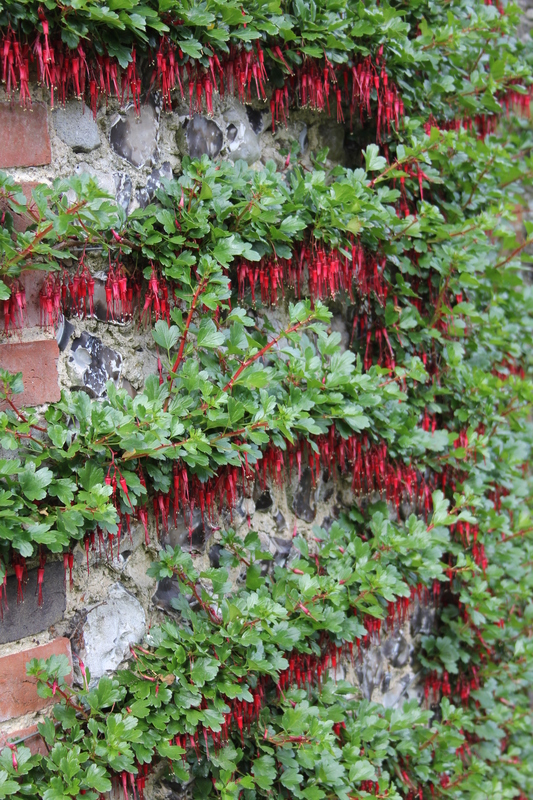 And finally, something which (in addition to everything above) sums up West Dean to me – a wonderful structure (flint wall), covered in an imaginatively trained and beautifully grown flowering currant (Ribes speciousum). Now how many times have you seen that? 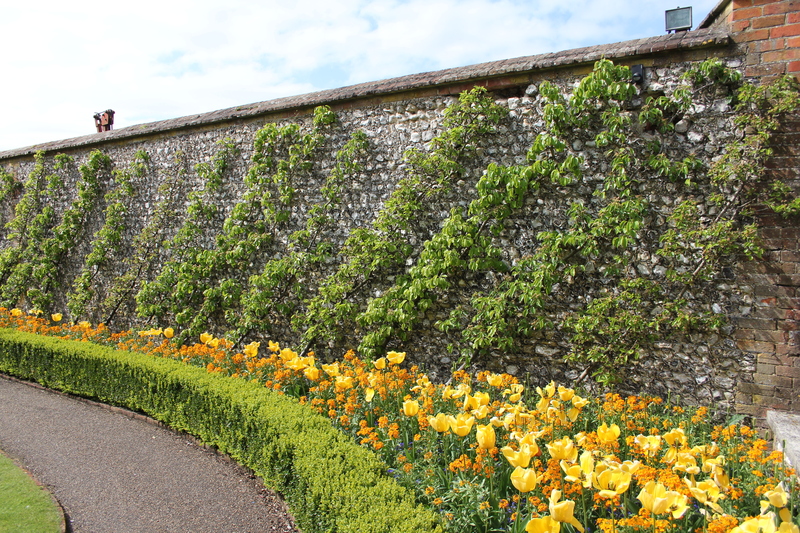 West Dean, near Chichester, has free entry for RHS members until the end of April. Just go, you won’t regret it. 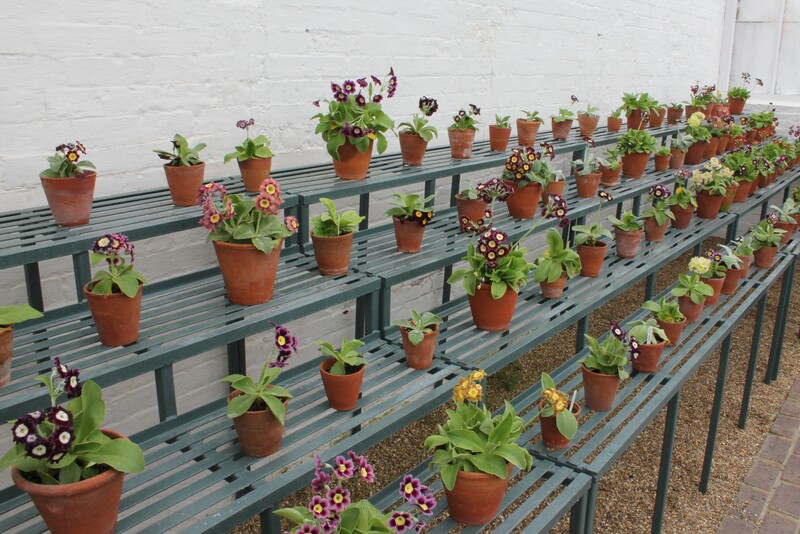 This entry was posted in Courses, Garden visits and tagged Auriculas, Crassula nealeana, Echeveria Runyonii 'Topsy Turvey', Echeveria shaviana, glasshouses, Jacqui Hurst, Jane Perrone, Lettuces, Pergola, Pitcher plant, Ribes speciosum, Strawberries, West Dean Gardens on April 23, 2014 by jenhumm116. Where are you blue (kangaroo*) mouse ears? 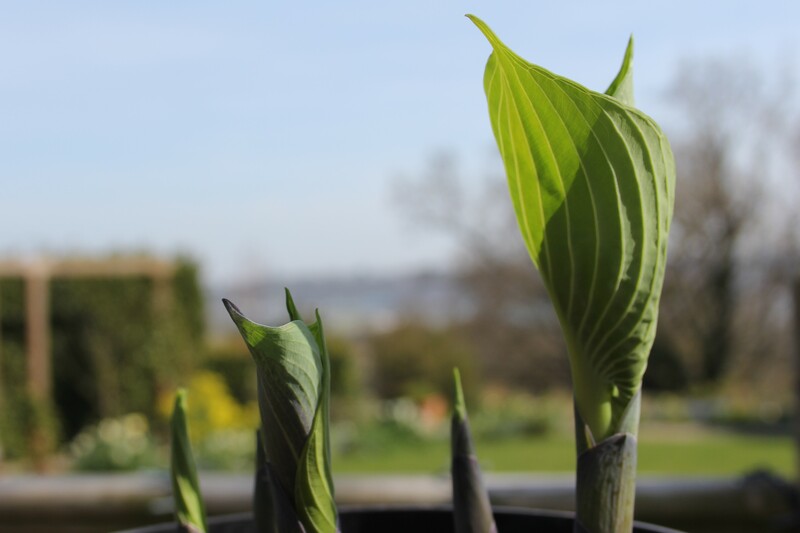 It started with a gift from lovely neighbour Martin a couple of weeks ago – a large pot containing a hosta, already showing its ‘horns’. It made me wonder where my hostas were, and the answer was, they weren’t. 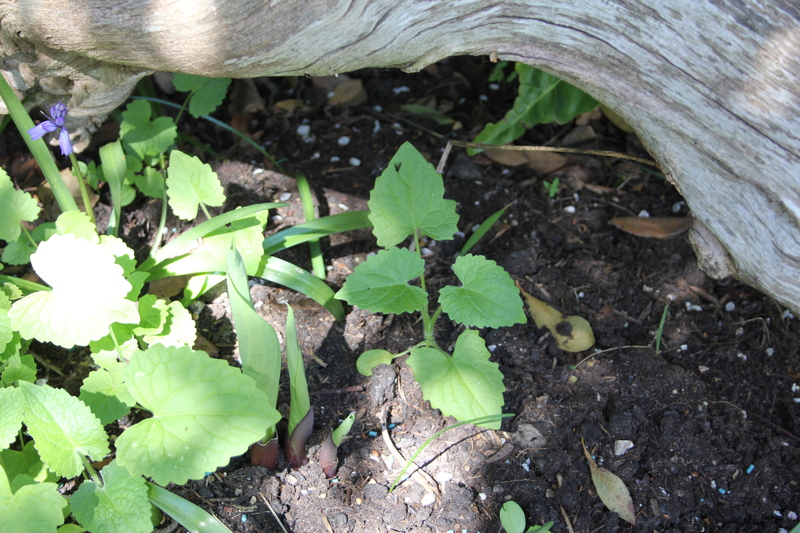 Fast forward three weeks and they’re all coming along well apart from one – ‘Blue Mouse Ears’. I have two beds including hostas, the first, the aptly named ‘hosta bed’ was created last year in a small north facing strip of a bed behind the new porch. I was due to open the garden in June, together with others in the village, under the ‘Secret Garden of St Helens’ banner, and thought this bed was looking particularly tragic with nothing but a rather untidy Hydrangea Petiolaris to offer. So when I was at the Chelsea Flower Show in May, I sought out the Bowdens stand, had a lovely chat and picked up a catalogue. I returned from Chelsea and, of course, a few weeks went by before I finally got round to phoning Bowdens. The phone call started well with the charming man at the other end of the phone saying ‘hang on a sec, just let me wash my hands’ – talk about hands on knowledge! I decided to order their ‘Surprise Collection’ of ten hostas, plus one – the Blue Mouse Ears which I couldn’t resist – “Just what it says on the label, blue, small and rounded like the ears of a mouse, but with a remarkably thick texture”. He gave quite a long delivery time, but when I explained the opening date was only a week away he quickly revised his estimate and said he’d get them to me within a couple of days, (despite the Chelsea rush) which he did. 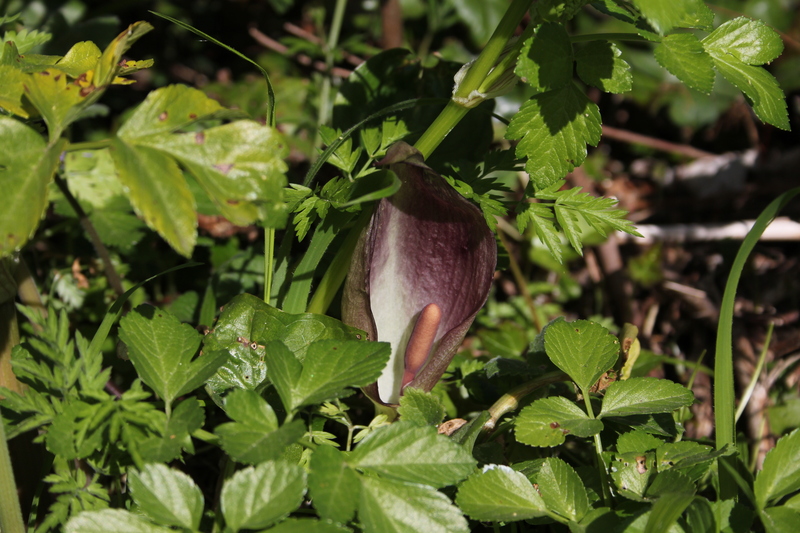 The hostas were all fabulous – bigger than I’d anticipated, an interesting mix and in wonderful condition. 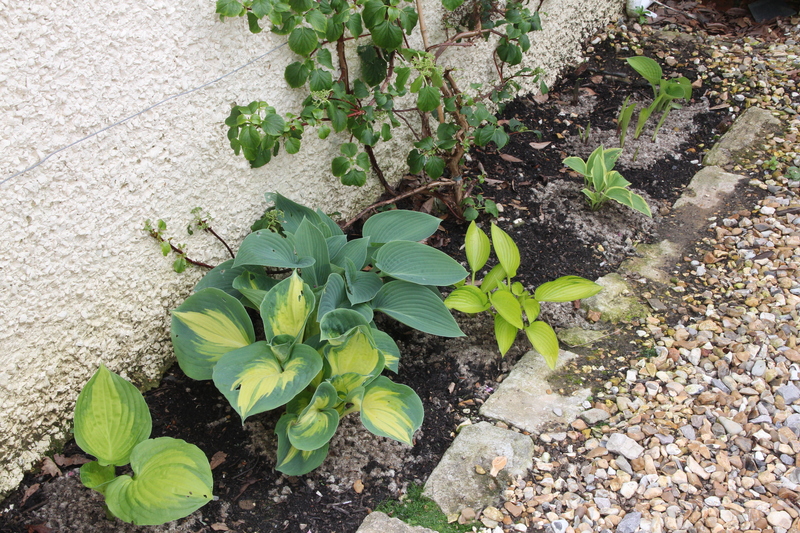 I planted up the hosta bed and still had some left over to add to the ‘shady bed’ too. See below some of the hostas up close (I did bury the lables with the plants, but haven’t dug them all up to identify them, sorry!) I’ve bought a huge tub of the wool based ‘Slug Gone’ which seems to be doing fine (the only one looking a little holey was the first one up which I hadn’t noticed, but of course the slugs had). 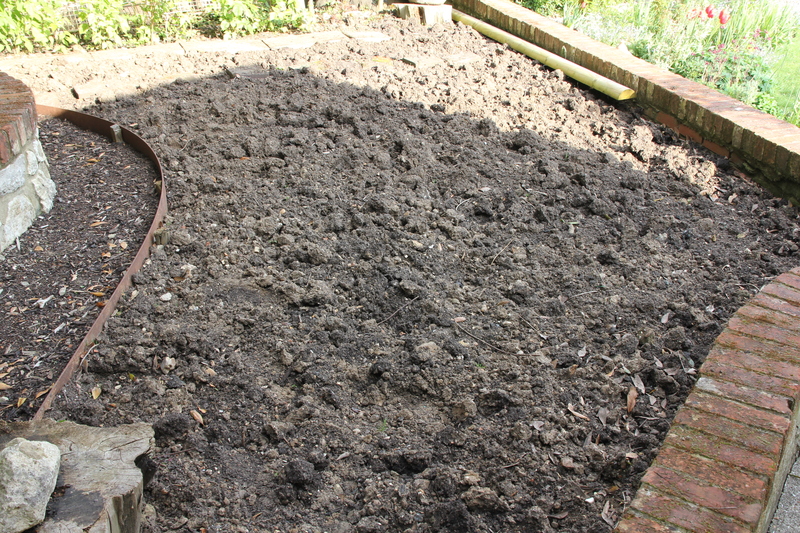 However the OH doesn’t seem to trust in the natural method and has added a few slug pellets. I’m not happy, partly because I don’t want to be using them, but also because it will now be difficult to see whether the Slug Gone has actually worked. I think a little pellet picking is in order…. The second bed is the so called ‘shady bed’, which actually gets more sun than I’d originally appreciated, but late in the day. The surprise success here is the inherited white rose (out of shot to the left of this picture), which rather undermines the theme of the bed, but is beautiful so I just go with it, and have actually used it as a prompt to make this a largely ‘white’ bed. However, what’s sadly missing so far is my extra purchase, my Blue Mouse Ears. Let’s hope they’re still coming. Fingers crossed. *For those without relevant aged children “Where are you blue kangaroo?” by Emma Chichester Clarke is a lovely children’s book about a lost toy. Thankfully it has a happy ending, let’s hope mine does too. This entry was posted in Garden and tagged Bowdens, Chelsea Flower Show, hosta Blue Mouse Ears, hostas, Hydrangea petiolaris on April 20, 2014 by jenhumm116. Like Annette at her Aberdeen Garden, it really is all about the tulips. 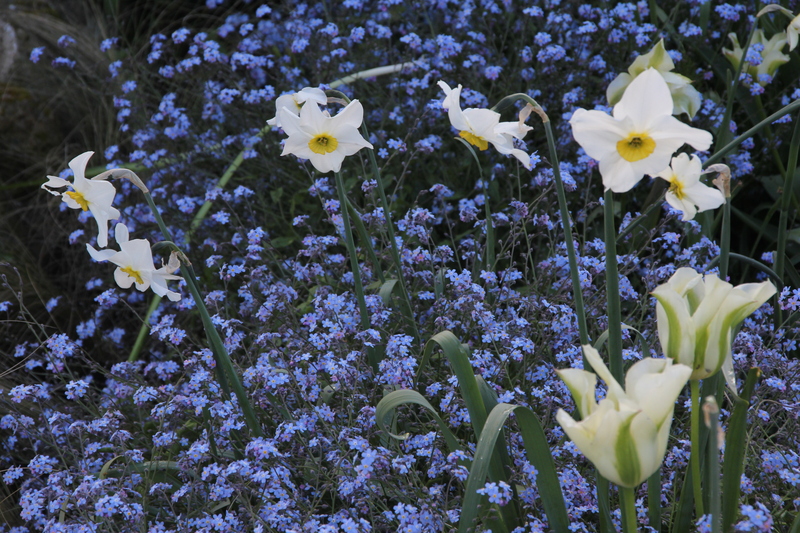 Above you can see Tulip Spring Green in the grass bed emerging from a froth of forget-me-nots. I know some people are a bit sniffy about forget-me-nots but I pulled all mine out last year and then regretted it, so this year I’ve allowed them free rein, and they’ve really gone for it. Anyway, I seem to recall Christopher Lloyd was a fan, so that’s good enough for me. There’s also another white tulip in this bed, but it’s very early and has already come and gone. 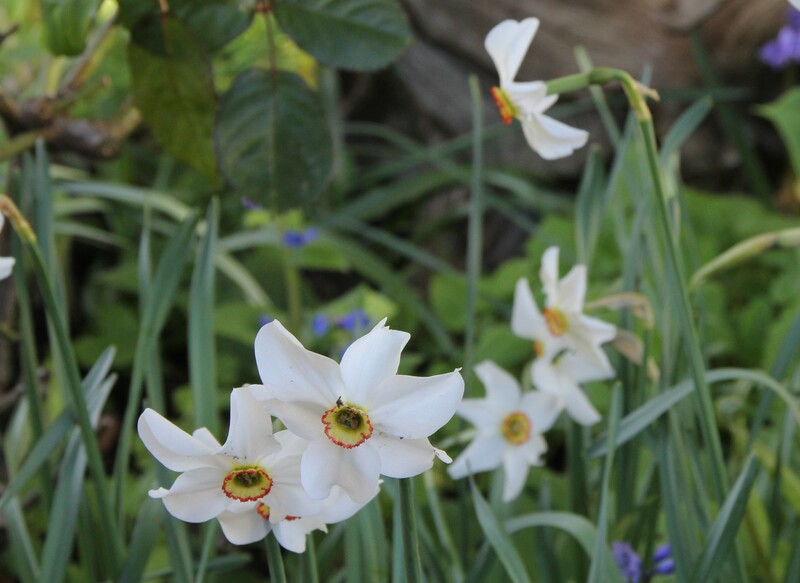 Conversely, my Narcissi Sinopel, which I bought last year because I was intrigued by its slightly green trumpet, has only just come out – I thought it had gone blind. However, like last year, the green really isn’t very obvious, and also (as mentioned in a previous post) it does tend to look towards the sun and therefore faces the road rather than the garden, leaving the colour of its trumpet a little academic! and Avignon, together with the species tulip Honky Tonk. 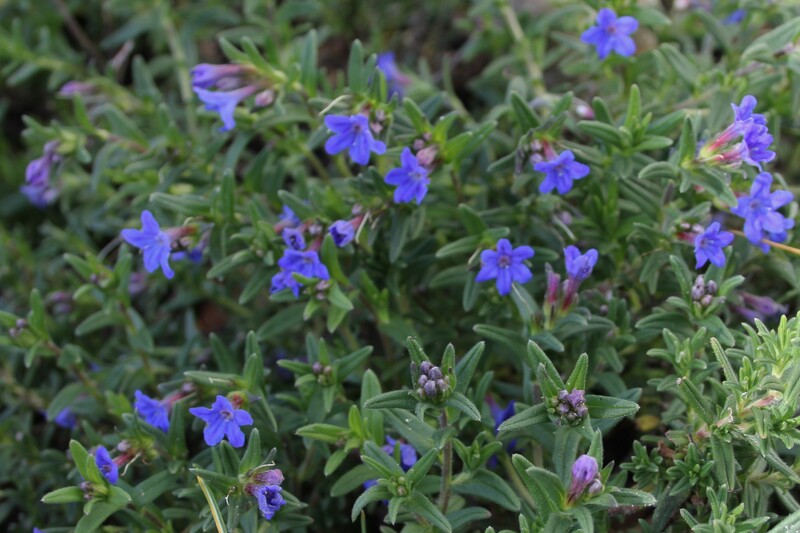 These latter two are in a huge pot by the entrance steps, sitting just behind my Rosmarinus officinalis ‘Prostratus’ which just keeps on flowering. The tulips were supposed to flower successionally, but this beautiful sunny weather has obviously accelerated the Avignons, well ahead of their supposed May flowering. Sad to think they may well have come and gone by next month’s GBBD. 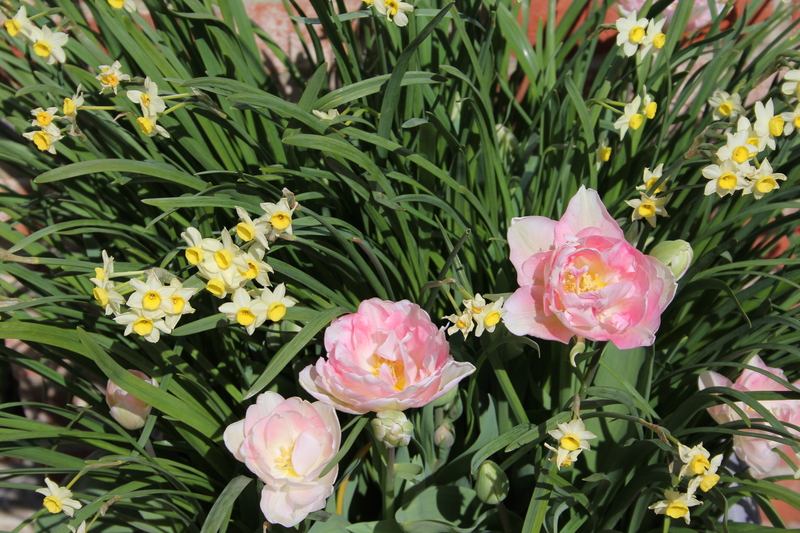 Another succession which hasn’t quite worked is the Angelique tulips in the pots by the greenhouse doors. 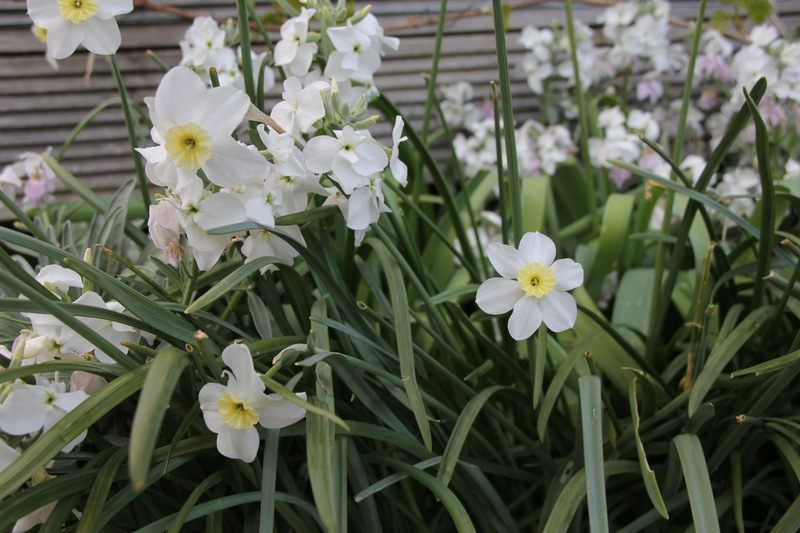 The Minnow Narcissi are still going strong, but the Angeliques are muscling their way in, strange behaviour for something so girly! 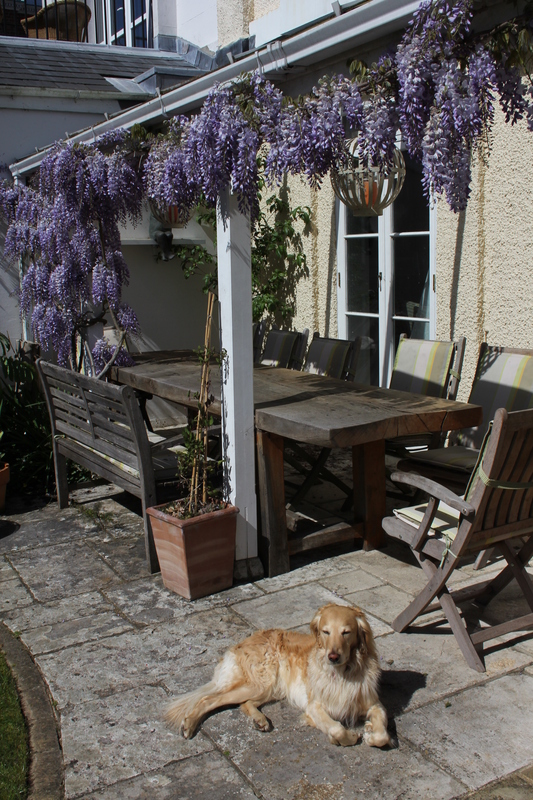 and to finish, the Wisteria (and Nimbus). With thanks to Carol at May Dreams Garden who hosts this meme on the 15th of every month. 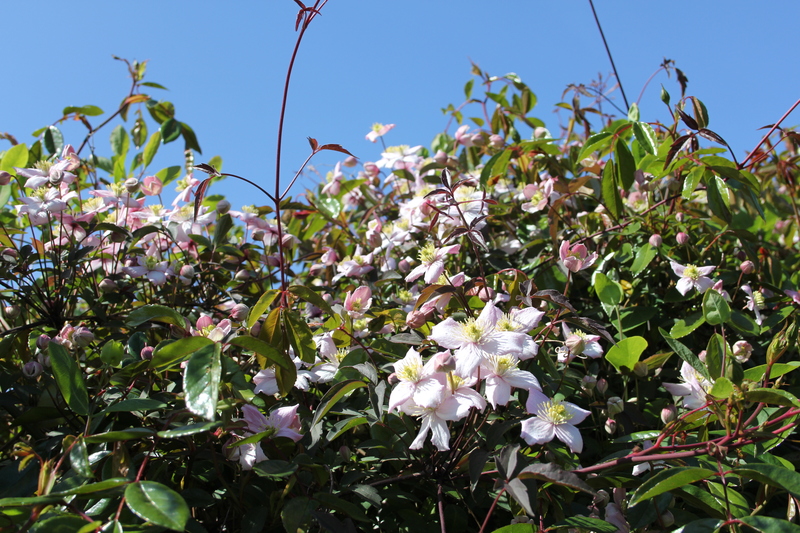 This entry was posted in Garden, Garden Bloggers' Bloom Day and tagged Clematis montana, melianthus major, Narcissi Sinopel, Tulip Angelique, Tulip Apricot Foxx, tulip Avignon, Tulip Doll's Minuet, Tulip Honky Tonk, Tulip Spring Green, Wisteria on April 15, 2014 by jenhumm116. Since my last Duver post just under two weeks ago, things have gone MAD. I just Googled to see whether there is a collective noun for Bluebells, and whilst the answer’s ‘no’, Paul Wiegman, in the Pittsburgh Post-Gazette suggested there should be collective nouns for many wild flowers, and came up with a ‘pealing’ of Bluebells. That might work for the gentle scattering shown below, but for a proper bluebell wood it seems a little understated. Instead I propose a ‘ding dong’. What do you think? 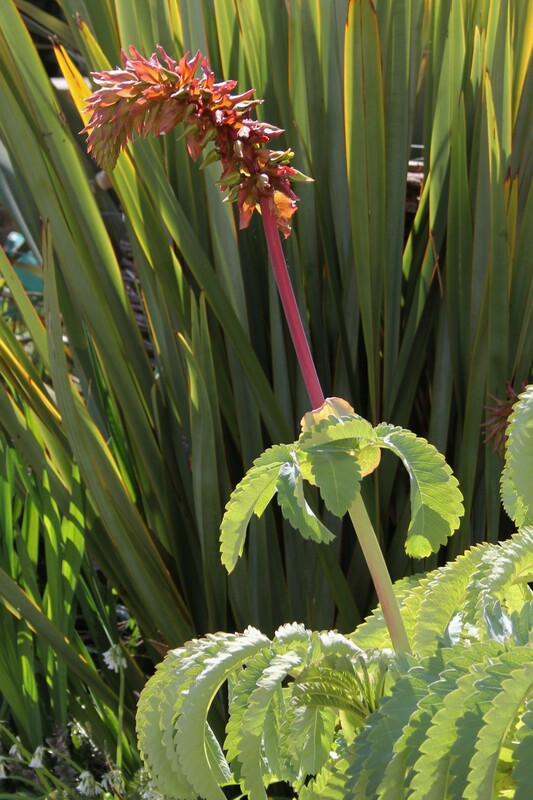 and this one, which looks familiar, but I just can’t find out what it’s called. Someone put me out of my misery please? And to finish, a bench, to celebrate the arrival of weather you can actually sit out in – hurrah! This entry was posted in Duver and tagged Alexander, Bluebells, Greater Stitchwort, Herb-Robert, Lesser Celandine, Lords-and-ladies on April 14, 2014 by jenhumm116. Now I’m not much of a gadget girl, and could bore for GB about the evils of leaf blowers, but sometimes you need a bit of kit to do a specific job, and today, after hours of using both, I’d like to celebrate two tools. 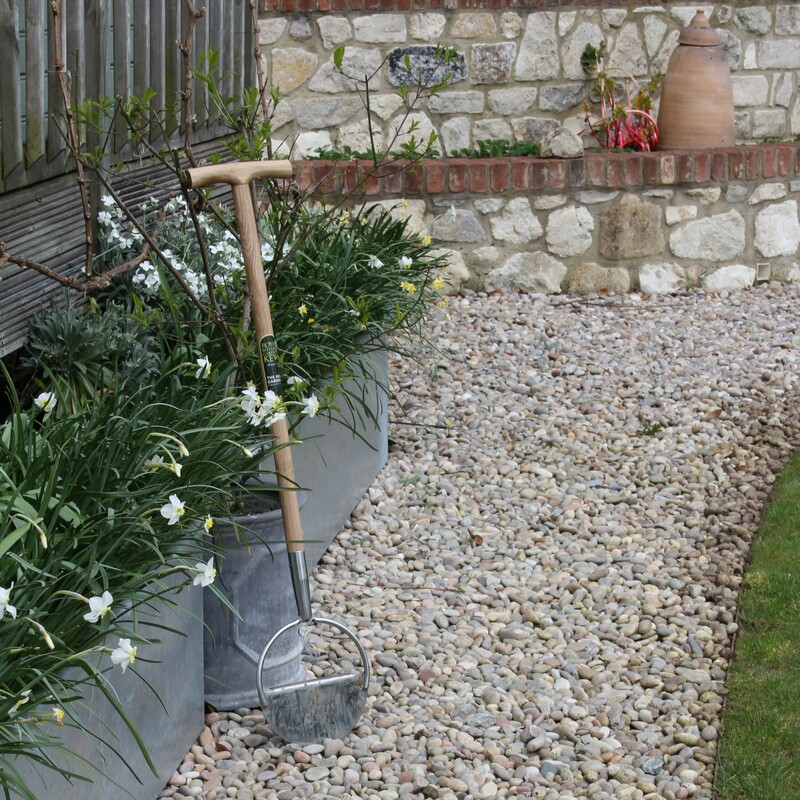 Firstly, my brand new, very handsome Spear and Jackson half moon edger (above, leaning seductively against the second wave of narcissi in the troughs). 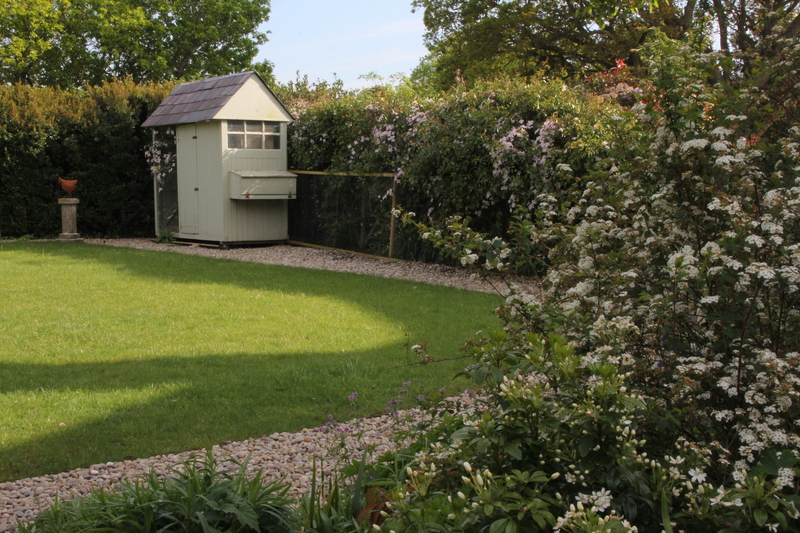 When we had the garden reconfigured four years ago, we used 3 metre iron strips to edge the lawn and new beds, and initially they did a fabulous job. However, over the years, soil has crept in between the pebbles and where there’s soil there will be growth. 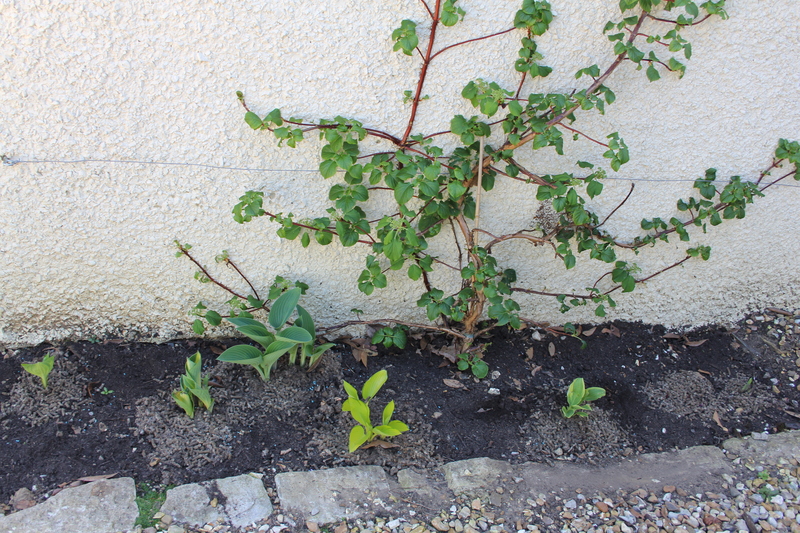 And whilst some of that growth was rather charming (Cerinthe or forget-me-nots I might ignore) much was just grass. And today was the day to reclaim my edges, and I’m delighted to say my half moon edger did me proud. Secondly, my Burgon and Ball Paving and patio Brush and Knife. I’ve had this over a year and actually bought it at Mottistone. It has a metal point at the end. 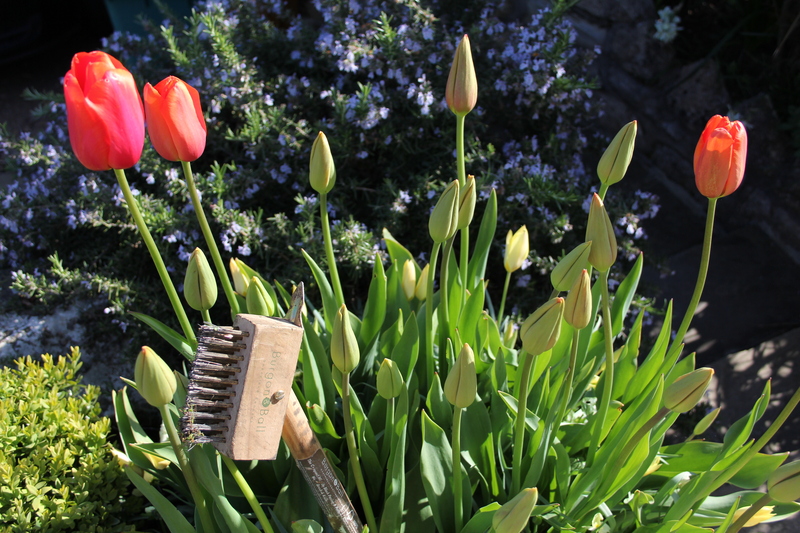 and then a heavy duty wire brush, and is just perfect for scraping and brushing between paving slabs. Admittedly on its first using the head fell off and had to be screwed on by the OH, but I’m prepared to forgive it as it has done yeoman service ever since. And to finish, two close ups of plants included above. 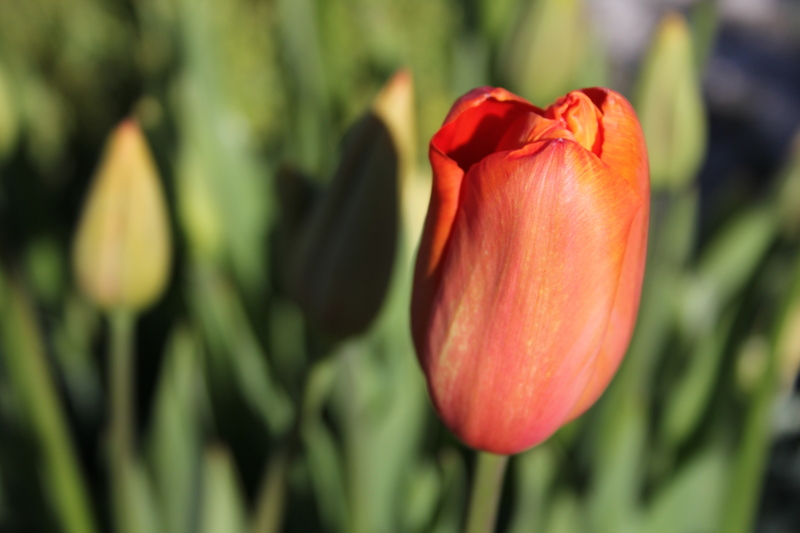 And then a close up of my new Tulip ‘Avignon’. 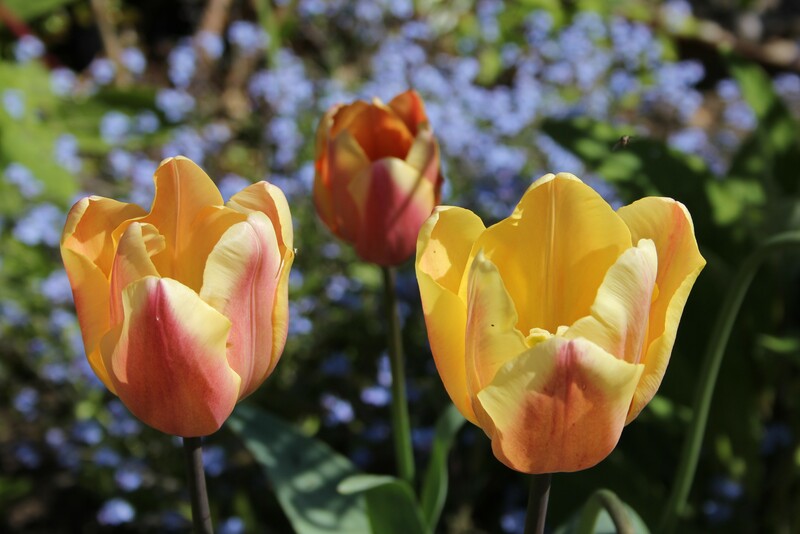 I spent far too long going round and round the ‘Bloms’ stand at Chelsea last year trying to choose a tulip which would show up in the garden when observed from the house in the sort of murky, grey weather we suffered last spring, and I went for Avignon. I know it’s a bit of a cliche, but the colour really is like shot silk and makes me think of evening dresses (and The Sewing Bee!) and guess what? Like so many things, it’s even more gorgeous in the sunshine. 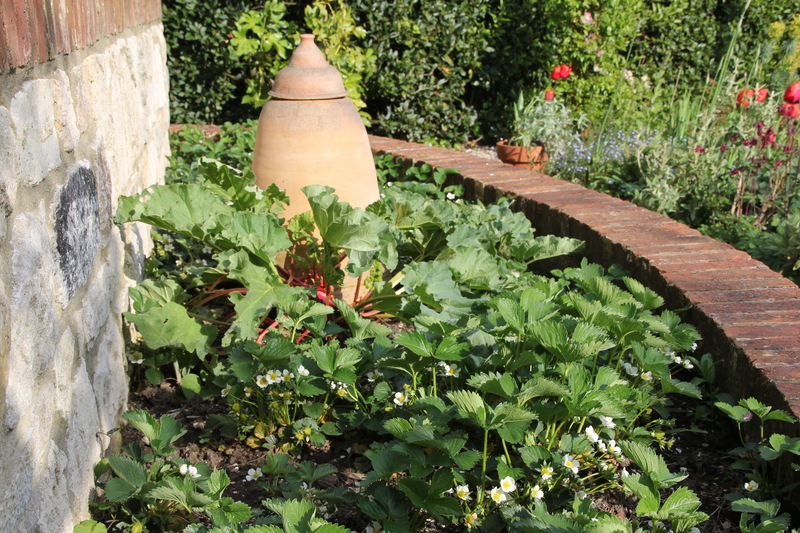 This entry was posted in Garden and tagged Rhubarb, Tools, tulip Avignon on April 13, 2014 by jenhumm116.